If zoning, taxes and enrollment are linked — there’s lots of evidence they are — then current zoning ordinances will lead to higher enrollment and higher school taxes. The City of Rye is not unique; while circumstances vary, many cities and towns in Connecticut, California, Georgia, Utah and Texas are revising zoning ordinances to balance smart growth with school and community needs. Draft an updated Master Plan. The City of Rye Master Plan was written in 1985 and is out of date. A new well-reasoned master plan will help meet the needs of the present without compromising the ability of future generations to meet their own needs. Align RCSD and town-planning goals by creating a steering committee consisting of members of the Rye City Council, the Board of Education, the Planning Commission, the Board of Appeals, and the Architectural Board of Review. Zone for multigenerational neighborhoods. A survey of adults older than 55 found that 89 percent would like to stay in their current residence as long as possible (Bayer and Harper 2000). Balance housing stock by creating zoning overlays to retain downsizing baby boomers and their aging parents. Research by AARP shows most aging Americans do not want to live in communities separate from younger people. Create financial incentives and technical assistance, such as tax abatements and contractor referrals to help residents acquire and refurbish historic Rye cottages and low rise homes. Negotiate voluntary easements and covenants — if every home voluntarily cut back just 100 allowable square feet (about the size of one bedroom), it could save the RCSD $150 million over thirty years ($313 s.f. cost to RCSD x 100 s.f. x 5,425 homes). In comparison, 100 square feet would generate just $17 million in city tax revenue over the same thirty year period. Adjust the mix of uses and densities permitted in specific areas to align with capacity of the RCSD. While it’s true, it’s vital to balance school capacity with AHC targets, most residential expansion over the past six years was in the high-income, owner-occupied housing stock. Revise floor-area-ratios and lot coverage requirements to ensure resulting structures encourage community balance and alignment. Place moratorium on demolitions to allow time to develop long-term plan aligned with the RCSD. Revise development standards to define criteria for building height & width, roof pitch, garage/driveway locations, front and side setbacks particularly well-suited to households less likely to increase RCSD enrollment. Eliminate Development Tax Breaks like the low assessment on land vs. improvements, and extended tax holiday on recently improved properties. Track and publish residential expansion statistics with likely impact on RCSD enrollment. Close zoning and tax loopholes such as raised grades, “front-side setbacks,” average roof height, and third story livable space. Place moratorium on extensive basement rock-chipping excavation as untaxed third-floor and basement play/nanny-space may attract households that are likely to increase RCSD enrollment. Develop historic real estate marketing and eduction programs to inform buyers about the history of Rye. For example, many smaller homes that are being torn down were summer residences for famous entertainers and celebrities. 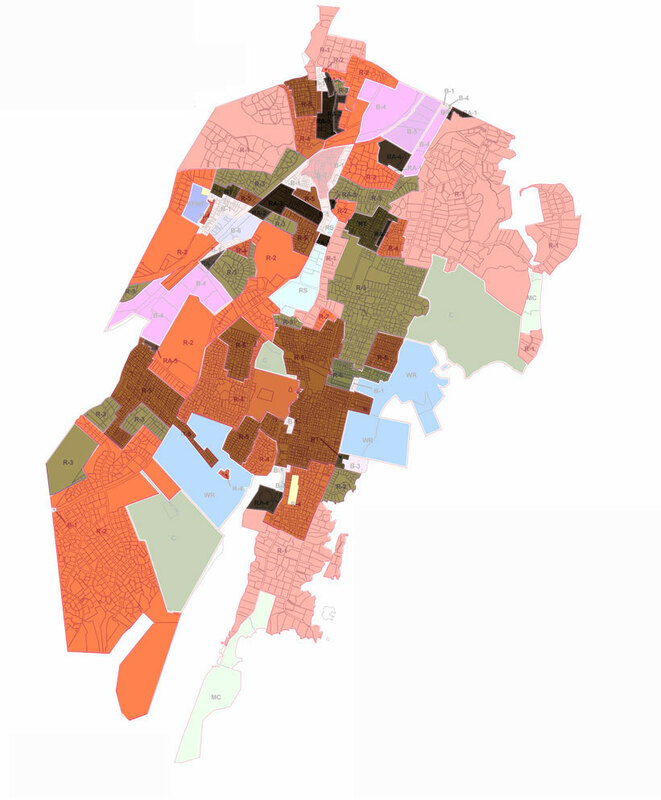 The map at left shows geographical distribution of City of Rye residential zones. 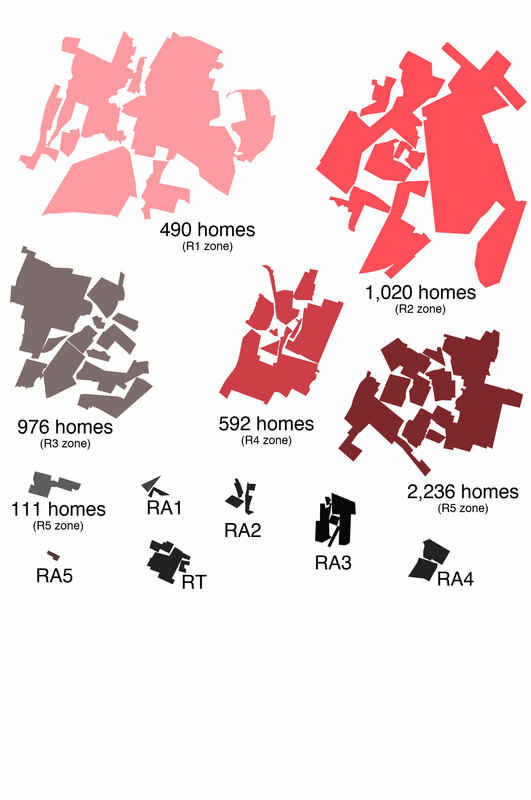 The map at left illustrates different Rye City zoning districts grouped to scale and the approximate number of allowable homes in each zoning district. Taken together, the six detached single-family districts allow approximately 5,425 homes (not including multi-unit dwellings). 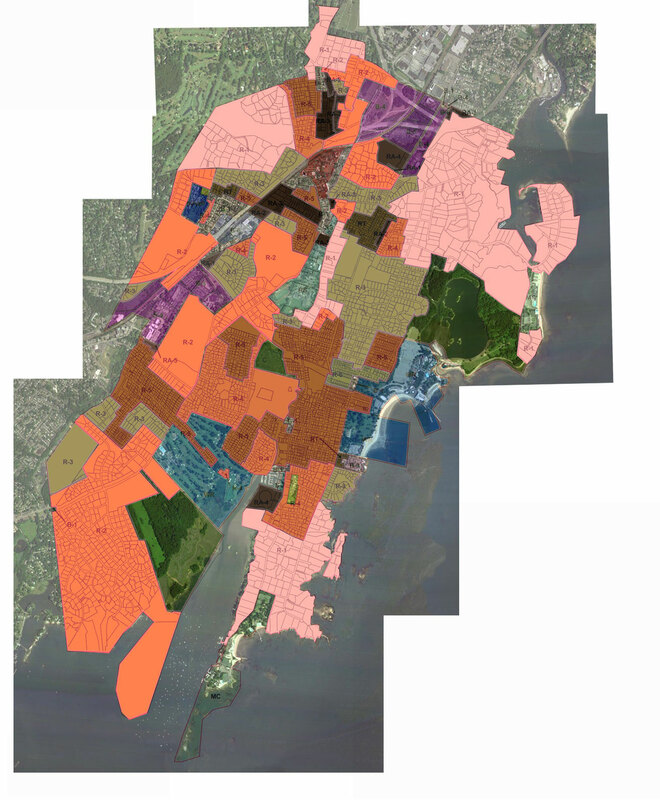 The map at left shows City of Rye residential zones overlaid on satellite imagery.